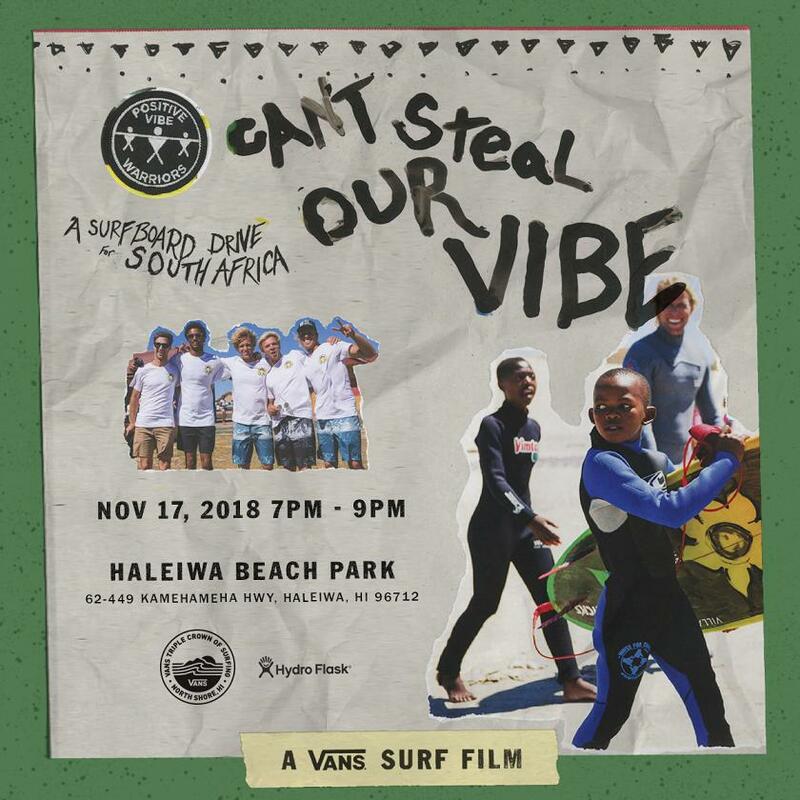 Come down to Haleiwa Beach Park on the 17th of November to watch the Vans film Can't Steal Our Vibe featuring Patrick, Dane and Tanner Gudauskas along with South African pro, Michael February. The “Can’t Steal Our Vibe” documentary film follows a grassroots initiative unifying two cultures worlds apart through a common love of wave riding. The mission of the Positive Vibe Warrior Foundation is to inspire individuals to make a positive impact within their communities. In 2017, professional surfers PVW co-founders Patrick, Dane and Tanner Gudauskas along with South African pro, Michael February, hosted a surfboard drive to benefit the Waves For Change organization in Cape Town, South Africa. Their goal was to provide surf equipment to the youngsters coming out of the poorest townships in the region and provide a positive outlet for them to overcome the adversities of poverty, violence and abuse. Tag along on an adventure from San Clemente, California to Cape Town as the G-Boys and Michael February immerse themselves into the vibrant culture of South Africa in hopes of sparking the next generation of young surfers. Can’t Steal Our Vibe will be available for Download on iTunes November 20th, 2018 Proceeds from the sale of downloads go directly to the Waves For Change Foundation. Music: Original Soundtrack by Bermudas Sound Co.